During the previous two modules, the students learned about the structures of the brain and what each does, and also about neurotransmission, the process through which information is exchanged between the brain and the rest of the body. 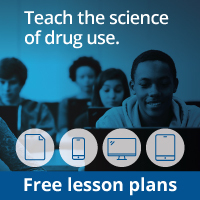 In the next two modules, students learn about drugs—some legal with beneficial attributes, some legal with negative consequences, and some illegal. The first group of drugs is called stimulants. Stimulants change the functioning of the brain and body. Students will be learning about caffeine, nicotine, methylphenidate (Ritalin), amphetamine, and cocaine in this module. Students learn how certain stimulants affect the brain and the nervous system. Students study PET scans showing the difference between a normal brain and one exposed to stimulants. Students discuss the impact of drug use.